Penn Jersey Signs is a full service weekend signage company. We will work with you to design yours signs, print your signs, design a route map and place and pick-up your signs every weekend. The only initial cost to you is the cost to produce your customs signs, and the placement and pick-up costs are billed monthly. Every sign and sign route are unique, call us today for a quote! We can screen or digitally print your directional signs. The pricing is dependent on the quantity, size and numbers of colors. Our sign printing is competitively priced for our weekend sign placement customers. Please call us today for a quote! The cost of our weekend service is dependent on the size of your route. 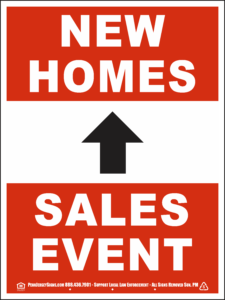 We have at least 1 sign every half mile to direct customers right to your sales center. Please call us today for a quote!